Chrissy Teigen is one of the many celebrities expecting a baby this year, but she isn’t exactly hiding her pregnancy. In fact, the model proudly flashed her baby bump in public in a loose white cropped tank and denim short shorts while having lunch with husband John Legend at the Il Pastaio restaurant in Beverly Hills yesterday afternoon. Chrissy, who is speculated to be five months along now in her pregnancy with her second child, covered up in an Alexander Wang tattered denim trench coat ($795 at Shopbop). She accessorized with a Janessa Leone “Chloe” Panama hat ($290 at Barneys New York), silver hoop earrings, and Victoria Beckham “Classic Victoria” 64MM aviator sunglasses ($1,250 at Saks Fifth Avenue). Chrissy Teigen and John Legend on a lunch date at Il Pastaio in Beverly Hills, California, on January 15, 2018. The cookbook author completed her lunch date look with buttery-soft Saint Laurent “Niki” leather thigh-high boots. 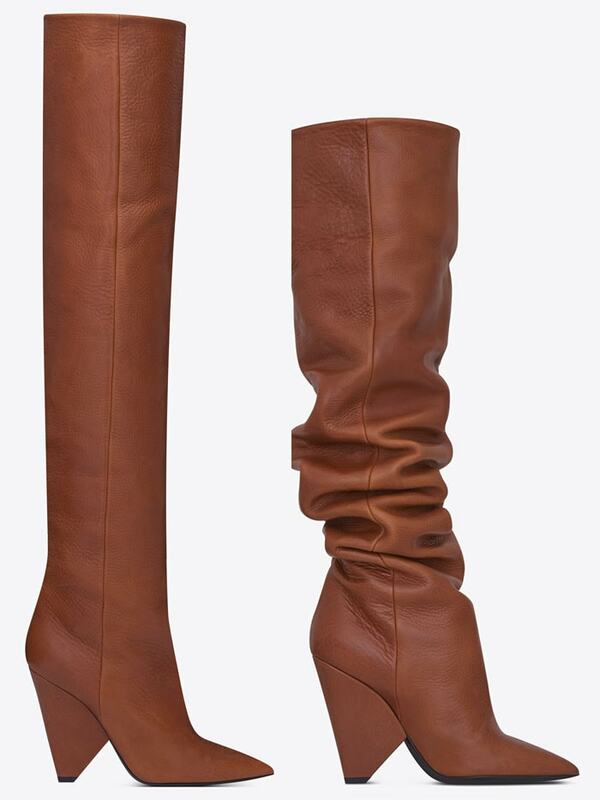 Closeup of Chrissy Teigen’s Saint Laurent “Niki” thigh-high boots in cognac leather. Chrissy Teigen’s exact boots are available at Saks Fifth Avenue. Check out the crystal-embellished version of these boots, which carry a hefty $10,000 price tag, giving them the title of most expensive boots of 2017!